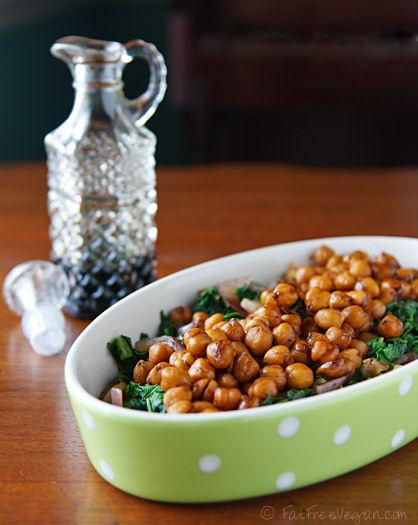 With some sweet red onion, cooked chickpeas, and a reduced balsamic dressing, mustard greens quickly become a complete, light meal. If necessity is the mother of invention, hunger is the mother of new recipes. Well, hunger, laziness, and a sadly depleted refrigerator. On a recent Sunday, I was out of everything I would normally eat for lunch–no lettuce, no spinach, no cabbage, nothing fresh and green and salad-worthy. I was also sadly lacking the desire to run to the store to get any of these items because that would take a lazy Sunday and turn it into a shopping Sunday, and who wants that? So I checked to see what green vegetables I did have in the house and found only mustard greens. Mustard greens. Until recently I thought I didn’t like them. Just the name “mustard” convinced me, erroneously I now see, that these greens were more bitter than collards and turnips (which, truth be told, I only started liking within the past five years). But a few months ago, my mother persuaded me to give them a chance. She described them, her personal favorite green, as milder than collards. And she was right. More peppery than other greens–they get that from their mustard lineage–they lack the somewhat cabbagey taste of collards. I find they cook more quickly than collards, too, which made them perfect for a quick-fix lunch for two on a slow, summer Sunday. 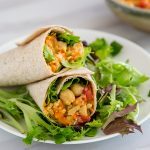 With some sweet red onion, cooked chickpeas, and a reduced balsamic dressing, they quickly became a complete, light meal. 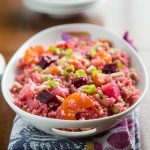 I’d say this fits into the category of warm dinner salads, but you could serve it as a side dish to up to four people. 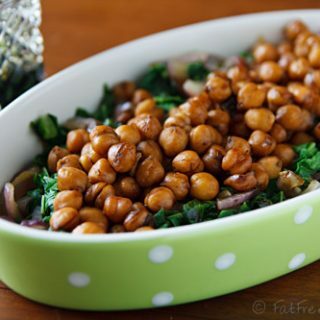 Reduce the sodium by using lite soy sauce and unsalted chickpeas. For some strange reason, I never tried mustard greens. My only experience with a lot of greens in general, was from cans when I was a kid. 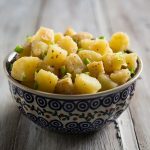 So though, I eat a lot of fresh veggies and am always trying to explore my way to things I haven’t tried, I had turnip and collards plenty of times and loved those… I pretty much love any greens that I can eat cold, as a wrap, or if I want a lovely wilted salad. Anyway, I bought a bunch of fresh kale, asperigus, and mustard greens. I just prepping to make a vegan spinach, asperigus, and artichoke dip that I could get normal people to eat, and I randomly grabbed a handful of mustard greens to no on…. I was so caught off guard… I know they are called “mustard” greens but I was so not expecting such a strong flavor! O_O I liked it though and since I’ve added dijon to plenty of dips and sauces, I snuck in some mustard greens and kale and…. it was amazing! I also had a similar experience trying swiss chard and somehow immediately decided to make it into a balsamic portabello mushroom burger with some spinach and steamed mashed cauliflower to bind. It was sooooo good! This dish was delicious. My omni housemate loved it! 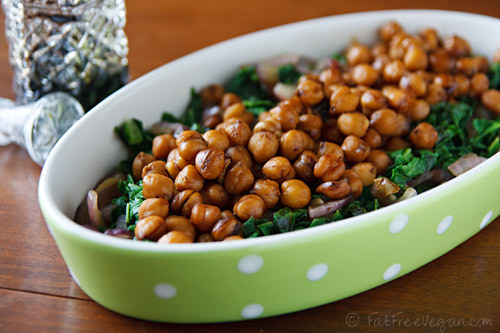 I used a whole bunch of mustard greens and a whole can of chickpeas. Plus I added a little more crushed red pepper and some black pepper. What a great dish to use the mustard greens I got from a friend’s CSA box. Thank you! I would love to try this… it looks delicious but does it really have 1081 mg of sodium or is that a typo. The only thing that I can see that would have high sodium is the soy sauce. I think it’s probably a miscalculation or a typo. Soy sauce and the optional salt do have a high amount of sodium, but probably not THAT much. I’ll run it through my recipe software again as soon as I’m back at my desk and update it if necessary. 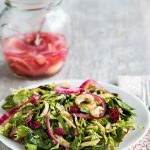 I found this recipe after my first purchase of fresh mustard greens and the realization I had no idea what to do with them. It was delicious and will become a regular meal in my home. Thank you for sharing your recipe!